Senator Bernie Sanders is currently campaigning to gain the presidential nomination for the Democratic Party. In some circles, he has become a cult legend, while in many others he is a crazy old kook that isn’t worth the time to learn about. So what is it? Is he the answer to many of the problems facing the United States right now or is he an uber liberal socialist that will destroy life as we know it? I hope to answer this question by analyzing the main issues he plans to focus on. Senator Sander’s most discussed issue is probably income inequality. He constantly steps up onto his stump to lambaste the 1% and preach that income inequality is tearing this country apart limb by limb as it grows larger everyday. The numbers seem to back his opinion. 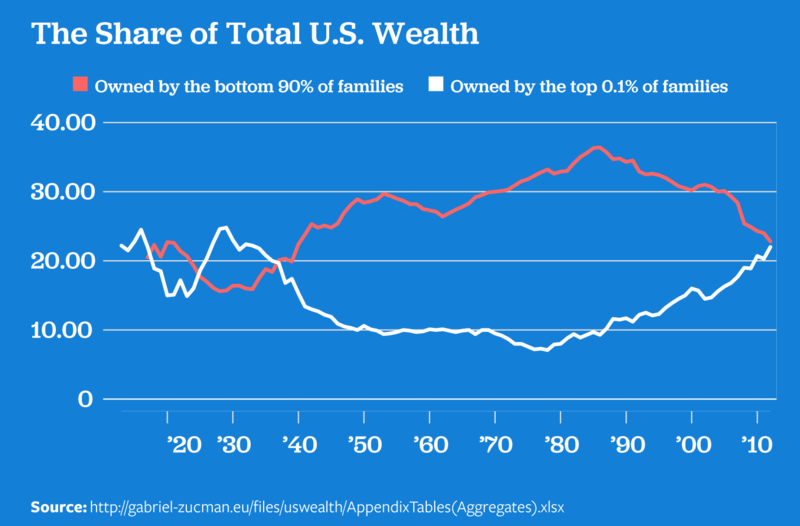 The gap between the wealthiest Americans and the rest of Americans has been growing since the late 1970s and is continuing to grow today. The data continues to astound when looking at the difference between the wealthiest 0.1% of Americans and the bottom 90% of Americans. Assuming there are about 320 million Americans, which is in the realm of reality, there are 320,000 people holding about the same wealth as 288 million Americans. That is 1 person with the same wealth as 900 people. Just let that sink in for a minute. 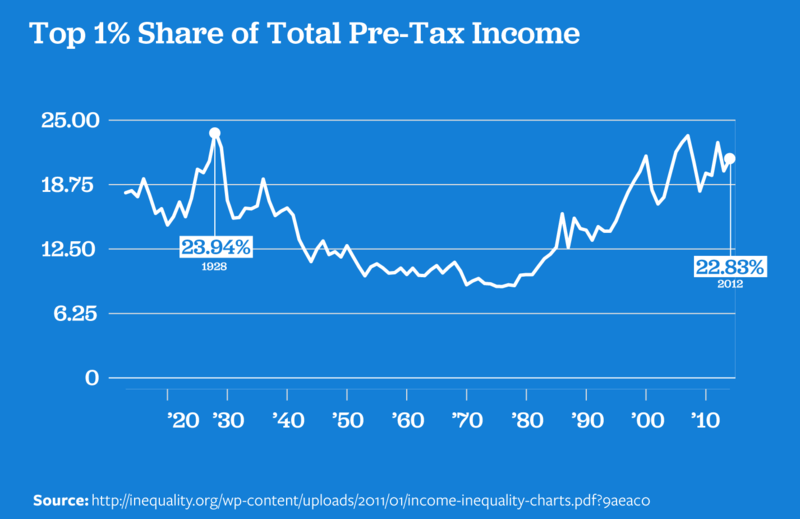 This gap was caused by the theory of trickle down economics or supply side economics. As an economist myself, I can tell you this theory is very flawed and simply does not work. Gazing up at the two graphs above should prove this to you, but if you aren’t convinced and want to learn more about why this theory is flawed then check out this clip from the documentary, “Four Horsemen” that features a few prominent economists discussing trickle down theory. You might ask yourself, what does income inequality have to do with sustainability? Well, actually a lot. Income inequality makes future generations worse off. There are strong correlations between income inequality and the rates of homicide, imprisonment, infant mortality, teenage births, and obesity. In addition to the obvious social consequences of these issues, the cost is substantial and wastes tax money that could be used for better purposes. In addition, the middle class is vital to the financial system. The middle class has the funds and desire to purchase consumer products that make the economy go round. Income inequality is spreading the income gap, which leads to the extinction of the middle class. The entire financial system we have implemented is unsustainable without a strong middle class. Senator Sanders believes that no person working full-time should live in poverty. While this is certainly an admirable thing to strive for, that significant of a hike is too much. The average American family consists of 2.58 people, but I will round up to 3 people and a higher poverty line to demonstrate the steepness of this wage hike. The 2015 Federal Poverty Level for a family of 3 is $20,090. Assuming 1 person supports the family of 3 working 2,080 hours a year (full-time employment), the minimum wage must be $9.66. This is a much more reasonable number and will not cause as much disruption to employers. Senator Sanders supports small business as the backbone of the economy because he feels that corporate megacompanies are a major reason for income inequality. However, increasing the minimum wage so substantially puts a great deal of strife on small businesses. These businesses do not have the overhead to pay every full-time minimum wage employee an extra $16,000 a year, let alone the $5,000 a year I am suggesting. This means that many will fail, while others cut employee hours. Neither will be good for the income gap. Investing money into infrastructure is both necessary and beneficial. The infrastructure in the United States is literally falling apart and is dangerous to use. John Oliver did a fantastic segment on his show “Last Week Tonight with John Oliver” where he explained the critical level of our infrastructure. Check out the long, but very informative clip below. Rebuilding the infrastructure allows the implementation of more innovative technology that is more sustainable and efficient. Creating a better public transit system could reduce carbon emissions from vehicles substantially. There is a new asphalt being developed that allows water to permeate through it, which will make roadways safer and allow for better storm-water management systems that promote infiltration, improve water quality, and many times eliminate the need for a detention basin. These are just a couple examples of more sustainable infrastructure that can be implemented, but clearly there is opportunity to improve. In addition, the amount of middle class jobs this will create is substantial. Millions of people will be able to earn a living wage while working to develop and implement better infrastructure in the United States. This proposed plan could significantly contribute to solving two of the biggest problems this country currently faces in income inequality and infrastructure deterioration. Free tuition at public colleges and universities is long over due in my opinion. The amount of student debt is crippling the younger generations and, in turn, the entire society. It is causing brilliant minds to reconsider whether they can afford an education and reconsider what they plan on doing. We are losing out on people that can solve the world’s problems because they decide to go into a less beneficial field that offers more money or worse yet, choose to not go to school at all. The easiest way to solve a problem is to become more educated. A community does better in all aspects when more educated, which is especially true with sustainability. There is a strong correlation between poor, uneducated countries and contribution to climate change. Poor countries have less innovation, leading to much more pollution. More education leads to more innovation and a healthier economy. Education is essential to solving the sustainability problem. The right to healthcare is essential to a sustainable community.There is no way to be sustainable when thousands of people are dying from treatable disorders because they cannot afford the cost of healthcare. Every other major country provides single-payer healthcare because they believe every one of their citizens deserves the right to beneficial treatments. Senator Bernie Sanders is unique. He is a genuine person that actually cares about making this country better for all people, that just so happens to be a politician. He’s a moral man that has somehow managed to protect his integrity during his 34 year political career. Theoretically, he is the type of candidate you dream about ending up in the White House. This isn’t because he is liberal. This is because he wants to make the country better, is an honest man with integrity, and has actual plans for bettering the country that thousands of people support. Unfortunately, if Senator Sanders was elected President of the United States, he would struggle to implement his policies. Congress would most likely stonewall him and not allow any of his citizen-backed policies to pass as law. Maybe I’m naive, but this isn’t how politics should work. Good people that truly represent their representatives should not be passed over because their ideas will never get implemented. That sounds a lot like giving up to me. I counter with the argument that rather than not electing people like Mr. Sanders, we should elect more people like him. If we filled the government with representatives as genuine as the Senator, a lot more would get done and this country would be a lot better off. So I implore you, whether you stand on the left or the right side of the spectrum to try to elect people that are genuine and actually care about what you want. If you don’t know how to spot someone like this, I suggest you watch Bernie Sanders and use him as a model. You can learn more about Senator Sanders at his campaign site.